El Paso periodontist Bruce Gopin is transforming smiles and improving dental function with dental implants. 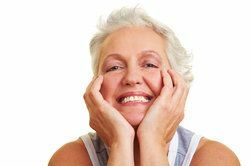 Dental implants are one of the most natural feeling options available for missing tooth replacement, as they closely mimic the structure of the natural tooth. Dental implants are screw-like titanium posts that imitate the natural tooth root by securely fitting within the tooth socket of the jawbone. As the jawbone heals around the titanium post, a permanent bond is formed. Once healed, different types of dental restorations can be attached to the implant to replace one or more teeth. Because dental implant treatment requires surgery, you should be aware of what to expect following the procedure. Though each recovery is unique to the individual, the following is an overview of what can generally be expected following dental implant surgery. Dental implant surgery is a simple procedure that many find to be of a similar pain level as tooth extraction. However, before dental implant surgery can be performed, the gums and jawbone must be assessed and prepared. In order for a dental implant to hold, there must be sufficient jawbone. This may be an issue for those who have experienced long-term tooth loss since the jawbone dissolves when there are no teeth present. Fortunately, a bone graft may be performed to rebuild the jawbone. Once the jawbone is deemed sufficient, the dental implants can be placed. When the jawbone has fully healed around the implant, a dental restoration, either a dental crown, bridge, or dentures, will be attached to complete the procedure. The total time required for recovery following dental implant surgery varies depending on the number of implants placed, whether a bone graft is needed, and personal healing times. In general, most people will reach a full recovery from dental implant surgery within six to 12 weeks. Some may consider this a long recovery time, but this can be explained by the fact that the bone must heal and bond to the implant, a process called osseointegration. During dental implant recovery, it is normal to experience sore gums and jaw. Any pain and discomfort felt is generally greatest immediately following surgery and should reduce over the next few weeks. For most patients, over-the-counter pain relievers are generally sufficient to alleviate any pain felt during the recovery period. Before taking any medications, be sure to get approval from your doctor. You can aid your recovery by avoiding crunchy and hard foods that can irritate the gums during the healing process. Practicing proper oral hygiene remains important during recovery. Switch to a soft bristled toothbrush and apply gentle pressure when brushing your teeth. Gargling with warm salt water is recommended during the recovery period, as the warm salt water is both soothing and has antiseptic properties. Dental implants have the power to transform smiles and improve quality of life. To find out if dental implant treatment is right for you, we welcome you to schedule a consultation with Dr. Gopin today.